Darning Stitch and Darning Patterns are created using several rows of Running Stitch. Running stitch is one of the simplest and basic stitches used in embroidery. Darning stitch is used to cover a background when it is desired to throw a design into relief or it can be used to fill the petals of a flower or its foliage. 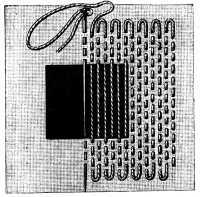 The figure below shows the method of taking the stitch. Only a few threads of the fabric are picked up on the fabric each time, thus long stitches of uniform length are shown on the right side only ; while the rows of stitches are parallel, the fabric is taken up on the needle for each stitch exactly opposite the middle of the long darning stitch in the preceding row. Darning and running amount practically to the same thing. 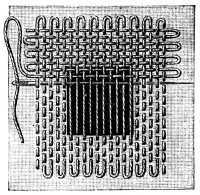 Darning might be described as consecutive lines of running. The difference is that, in running the stitches may be the same length on the face as on the reverse of the stuff, whereas in darning the thread is mainly on the surface, only dipping for the space of a single thread or so below it. Darning was originally used to repair clothes. Holes in old clothes were repaired using darning. In ornamental darning little or no working shows on the underside, the working thread being kept as much as possible on the upper side to sew the pattern in relief. The chief kinds of ornamental darning are : - (a) Straight ; (b) Waved ; (c) Diamond ; (d) Vandyke. Pattern darning is a type of embroidery that uses parallel rows of straight stitches of different lengths to create a geometric design. Net darning, also called filet lace, is a 19th century technique using stitching on a mesh foundation fabric to imitate lace. Huchaback or Swedish weaving embroidery. I am working on a Simple Darning Stitch sampler, hopefully will finish it very soon . Thank you so much Ms Sharma.